Sealed airtight for maximum freshness, our canned butter delivers convenience in the form of extended shelf life and easy distribution without the necessity of refrigeration. Fine quality Red Feather Butter available in portions. 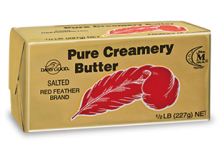 Fine quality Red Feather Butter available in salted and unsalted wrapping. 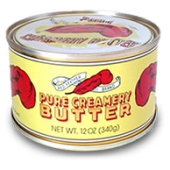 This premium quality butter is shipped at -18° to keep the product fresh and full of flavor. Red Feather. Simply pure, natural butter. 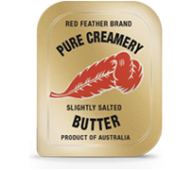 For generations, the distinctive red and gold Red Feather brand has reminded people of the delicious taste of pure Australian and New Zealand dairy butter. From country paddocks of rich green grass comes the milk that makes the butter that brings the fine flavours to Red Feather. Made by an Australian family company for more than seventy years, this is a taste with enduring appeal. From baking and cooking family favourites, to spreading on your favourite warm crusty bread, Red Feather will add a wonderfully buttery finish to everything you serve. Naturally, 100% pure Red Feather butter has no artificial colours or flavours, and for your convenience, it is available in traditional durable cans that do not require refrigeration or more modern wrappings that do. Discover the taste of Red Feather today. Heat the oven to 180°C (160° fan) 350°F gas 4. 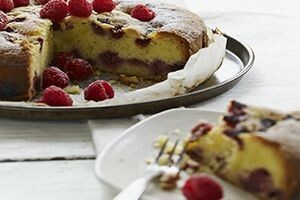 Butter a 20cm|8" cake tin and line the base with non-stick baking paper. Spoon into the tin and smooth the top. Sprinkle with the almonds. Bake for 40-50 minutes until golden and risen and cooked through. Cool in the tin for 15 minutes, then place on a wire rack to cool completely. The herb butter will keep in the fridge for up to a week. Place the butter in a small mixing bowl and beat in the chopped herbs. Mix in the lemon juice and season the herb butter, if desired, with salt and freshly ground black pepper. 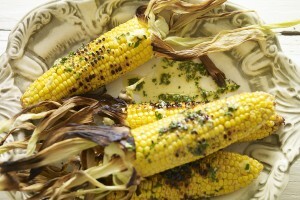 To serve, cook the sweetcorn in plenty of boiling water until tender. Drain well, place onto serving dishes and spread with the herb butter. 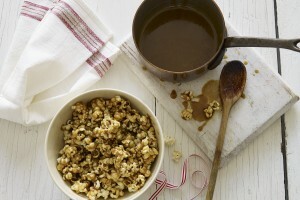 Put all the ingredients in a pan over a low heat and stir until the sugar has dissolved. Bring to a simmer and cook gently for 5-7 minutes, stirring, until golden brown. Serve warm or cold - the sauce will thicken as it cools.